Philosophy Lecturer Ian Schnee has adopted a classroom response system to ignite participation in his classes. But adopting a classroom response system known as Poll Everywhere challenged his own assumptions about technology and encouraged him to abandon his no-screen policy. Poll Everywhere turned a traditional classroom lecture into a productive beehive of activity, with 200 students wielding an array of laptops, tablets and cell phones. Students use Poll Everywhere on their personal mobile devices to answer questions and polls that Schnee sends their way throughout the class. And depending on how he sets up the system, their collective answers are tabulated and immediately displayed on the screen so students can compare their answers. To outsiders, Poll Everywhere — the UW’s preferred classroom response system — may seem an unlikely disrupter of the pedagogical landscape, but for Schnee and other faculty members at the UW, the app and other classroom technologies are helping them guide their students into becoming better critical thinkers — and making them better teachers too. To accomplish those goals, they have partnered with like-minded UW colleagues, adopted evidence-based teaching strategies and brought evolving technologies into the classroom to enhance the teaching and learning experience. The same is true for marine biology instructor Jose Guzman, who moved away from the traditional lecture format by “flipping” his classroom. Guzman is now among the most proficient users of Panopto Lecture Capture, which enables faculty to easily record video for lectures, presentations and other uses. For Schnee and Guzman, it wasn’t a slam dunk to break away from teaching in a traditional lecture format — to step away from being the center of undivided attention. To make it in this new space of “flipped” classrooms, audience response systems and self-produced faculty videos, they said, means being willing to be a bit uncomfortable. Instructional designer Dave Coffey understands why new teaching strategies and technologies make some faculty uneasy. And because he works closely with UW faculty seeking to use tech tools in their classrooms, he guides them into making the right decisions for their teaching environments. 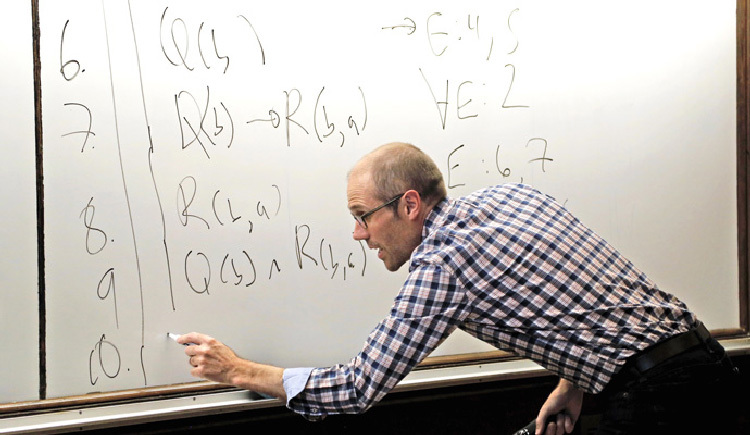 “For some instructors, there’s a natural cynicism to introducing new tools in the classroom,” said Coffey, a member of the Academic Technologies team in the Office of Academic and Student Affairs. Will it take a lot of time to learn to use all these new tools? Coffey gets asked. Do they actually enhance learning? And, What is wrong with a typical lecture course? “These are legitimate questions, and that’s why we think long and hard about what to provide to our UW community,’’ said Coffey, whose group partners with University of Washington Information Technology (UW-IT) to adopt and support tech tools that are in use at all UW campuses. These include Canvas, the UW’s learning management system, Poll Everywhere and Panopto, among others. The EBT, now under the leadership of the Center for Teaching and Learning, offers a community of peers and mentorship for faculty seeking to become better teachers. The program encourages research on pedagogy and the use of new techniques and tools to help students become better learners. Step into one of Ian Schnee’s large introductory philosophy lectures, and you might think no one’s in charge. Laptops are open, cell phones are readily in hand, and 200 students break into dozens of small groups that quickly erupt into lively discussions. The room vibrates with a palpable energy that Schnee relishes and encourages — knowing that having students talk to each other about what makes a good or bad philosophical argument solidifies their learning. During a recent class, he started by displaying an argument on the screen and asking students to respond to the question, Is this argument any good? Students already have loaded the Poll Everywhere app to their devices and use it to answer follow up questions that Schnee flashes on the screen, producing more conversations about the meaning of an argument. 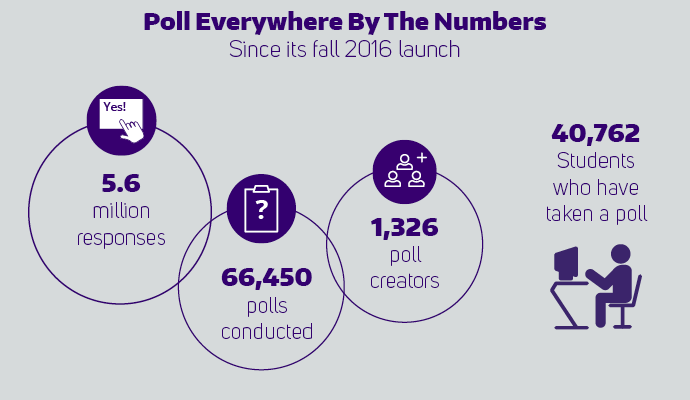 Poll Everywhere was introduced at the UW in fall quarter 2016, and Schnee became one of the first UW faculty members to incorporate it into his classroom. He had to overcome his initial skepticism about these systems. In fact, Schnee used to ban all screens in his classes. There’s a strong body of evidence that shows cell phones and laptops in the classroom can be detrimental to learning. Even typing notes on a computer is not as effective for retention as writing notes with a pen or pencil, he said. That evidence was part of what led him to develop his no-screen policy. But Schnee knew if he could keep his students engaged throughout the class, he could overcome what is known as “drifting,” the moment when they disengage from the class and bury themselves in their devices. 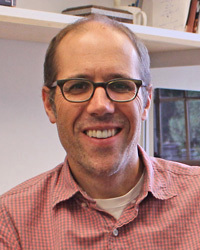 To keep his students from drifting, he increased the level of engagement with Poll Everywhere and other evidence-based teaching strategies such as collaborative group work, think-pair-share activities — where students work together to come up with answers — and the judicious use of random calling, which increases participation while decreasing instructor bias. In a typical lecture, Schnee will use Poll Everywhere nearly a dozen times, presenting a wide array of challenging questions that promote lively discussions and challenge critical thinking, and he follows up with random calling to hear from as many as 20 different students. For Schnee, preparing 12 poll questions per class and ensuring fairness with strategies such as random calling means more work, but the effort pays off — keeping students from drifting away from engaging philosophical discussions. As he nears the end of a three-year study to assess the impact of Poll Everywhere on the classroom, preliminary data shows the app has changed the dynamics of his classrooms for the better. Jose Guzman likes to keep things simple, and that includes his video production. His studio is his own small, austere office in the Fisheries Teaching and Research Building just off Portage Bay. A yellow Post-it note on the door warns visitors not to interrupt his recording sessions. In the last two quarters, the marine biology instructor has stuck that note to his door countless times, producing a library of 5- to 10-minute videos. He now has more than 60 videos about the ocean and the seas — from the properties of water to the importance of coral reefs. In a recent summer quarter, his students watched 30 different marine biology videos that Guzman produced just for this class. And that wasn’t all. 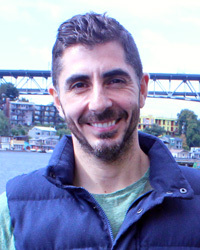 Guzman asked a dozen marine biology colleagues across the globe to make four-minute videos to challenge his students with problems facing the environment. You might think Guzman has been making videos all his life, but he began only about a year ago, shortly after joining the EBT group. “You have to understand that I came from a European school system, where we would see professors only in class, and the professor was the only one talking. That’s a very ineffective teaching approach, but it’s how I was raised,” said Guzman, who is from Spain. So when he heard about the flipped classroom strategy in an EBT session, he began thinking about how he could adopt that approach. A flipped classroom upends the traditional way of teaching and learning, with instructors delivering lectures online so students can learn outside the classroom at their own pace and time. More interactive activities, such as tackling case studies, move into the classroom, allowing students to work together and with the instructor to solve problems. Video has become a key tool to deliver important material outside the classroom, which had been previously done in a lecture format. The latest generation of students are tech-savvy, and faculty are finding ways to use technology to help them become better critical thinkers. Guzman signed up for a video production workshop to learn how to better use Panopto, which helped him focus his content. He learned how to carefully choose stand-alone subjects that could be explained in short videos, and with meticulous care, he ensured high quality and useful captioning for more accessibility. Video production takes a lot of work but Guzman is getting better at it, spending a couple of hours to write script, record and caption each video. And he is more confident in front of his own camera. Once a video is done, it can be reused multiple times, becoming part of a growing library. There were other reasons why Guzman switched to a flipped classroom and more videos, such as offering a more nurturing environment for his students. Get started with Panopto and Poll Everywhere. Visit the Faculty Quick-Start Guide in IT Connect for other resources or send an email to help@uw.edu. Also, read more about the Evidence-Based Teaching Program. Learn more about teaching and learning at the UW and how UW-IT contributes. Read how UW-IT will collaborate with partners during 2019 to help students succeed.